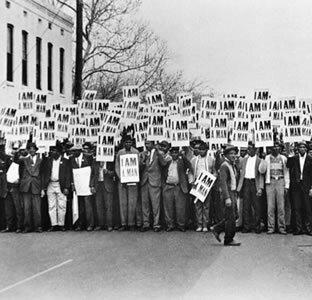 "I Am A Man, Sanitation Workers Assemble Outside Clayborn Temple, Memphis, Tenn.," 1968, gelatin silver print, 8 1/2 x 14 3/4 inches, Ernest C. Withers. Courtesy Panopticon Gallery, Boston, Mass. (Jan. 15, 2014) -- The UTSA Department of Art and Art History will present "For All the World to See: Visual Culture and the Struggle for Civil Rights," from Jan. 22 to Feb. 26 in the UTSA Arts Building Gallery on the Main Campus. The exhibit is free and open to the public. "For All the World to See" graphically demonstrates the many ways that visual materials not only provide evidence of historic events but also influence them. Exhibit highlights include photographs from Life, Jet and Ebony magazines, news footage from CBS News and television clips from "The Ed Sullivan Show." The exhibit derives its name from the 1955 murder of Emmett Till at the hands of white supremacists. Mamie Till Bradley, the mother of the slain 14-year-old, decided to have an open coffin at his funeral so the thousands of people in attendance could see the brutality in everyday life. Her words, "Let the world see what I've seen," supported her belief that more people would support the cause of racial justice and equality if they were witness to the horrors of racism, segregation and violence. The image of her son's mutilated corpse became a flashpoint in the civil rights movement. "From the insidious to the blatant, discriminatory images have circulated in commercial contexts, journalism and the applied arts, and valiant responses have ranged from subtle coding to bold demonstration," said Scott Sherer, UTSA associate professor of art history and director of the UTSA Art Gallery and Satellite Space. "Both negative and positive imageries have told the story of the struggle for civil rights, from Aunt Jemima syrup dispensers and 1930s produce advertisements to Jackie Robinson baseball ephemera and 1960s children's toys marketed to African-Americans." "For All the World to See" was made possible through NEH on the Road, a special initiative of the National Endowment for the Humanities. NEH also provided an exhibition grant to UTSA. The exhibit was curated by Maurice Berger, a research professor in the Center for Art, Design and Visual Culture at the University of Maryland, Baltimore County. The Smithsonian National Museum of African American History and Culture co-organized the exhibit that was adapted by the Mid America Arts Alliance. Additionally, selections from the Paula and Edwin Miles Collection will help place the representation of the African American experience in a broader context. This local collection includes hundreds of artworks by well-known and emerging artists. "For All the World to See" will precede the seventh annual African American Studies Spring Symposium, "FLAME: 100 Years Forward in African-American Literary Arts and Media," on Thursday, Feb. 20 at the UTSA Main Campus. The all-day symposium will include presentations from a diverse array of scholars from across the nation. Featured guest speakers include Valerie Cassel Oliver, senior curator, Contemporary Arts Museum, Houston, and Howard Rambsy II, associate professor of English and director of Black studies, Southern Illinois University, Edwardsville. The UTSA Art Gallery presents a mix of professionally curated, juried and student and faculty exhibitions with an emphasis on larger and more complex projects. The UTSA Satellite Space in the Blue Star Arts Complex in downtown San Antonio divides programming between monthly curated exhibitions and presentations organized by UTSA graduate students in studio art and art history. Gallery hours are 10 a.m.-4 p.m., Tuesday-Friday; 1-4 p.m., Saturday and by appointment. For more information, contact Laura Crist at 210-458-4391.